The MLS version imports your listings directly from your MLS Board inventory. Upload your stitched photos and our Panorama Virtual tour will scroll it automatically. Includes our Virtual Tour Slide Show maker with 13 templates and 25 musical sound loops or upload your own voice or favorite music mp3! Attach a PDF of your flyer directly to the Virtual Tour. Click the Buy Now link after you set up your FREE trial. FlyerMaker Pro© saves you money by saving you time. FlyerMaker Pro© is easy to learn and use. FlyerMaker Pro© adds professionl quality to any sales presentation. One click gets your sale added to www.ForSaleWhere.com. 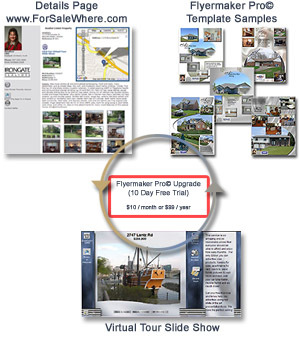 Hundreds of Realtors are currently using FlyerMaker Pro©. "I'd pay money to save myself time and this saves me time..."
"We really appreciates the fast support that Netwise provides any time we have a question that pops up." "You guys have an amazing product here!" "We use FlyerMaker Pro every day in our office." Flyermaker Pro© now allows you to add additional users to your subscription. This will allow you to quickly change the contact information and agent photos on any of your listing flyers to any member of your team. $10 for Team Leader Option. $15 for Office Leader Option. For Sale Where and 10 day FREE trial of Flyermaker Pro©. STAND ALONE (Non-MLS Version) - FREE trial setup! Note: If you dont see your MLS Region in the above list, you can still sign up for Flyermaker Pro© and For Sale Where as a STAND ALONE product. As we add new MLS Regions to our system, you can be upgraded to the MLS Interactive version at that time for FREE!